You can have the coolest website or forum that promotes online community, but if you fail to sell the vision to your community, it may be used only by the few that are fairly web-savvy. Helping your ministry see that these online tools are more than just ways of communicating, but are part of the culture and can be used as tools in the ministry will help them to understand the reason behind this new technology. When we first started building an online community for our students in August of 2007 I spoke with our volunteer leaders about the importance of being in the student’s world on the Internet. One thing I stressed was using their online profile information as a way into starting a conversation with them. We can in a sense be a student of students by knowing them better through the information they provide on these online profiles. Many students will (sometimes unfortunately) disclose more personal information on the Internet than they will in person. 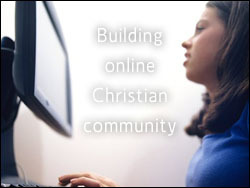 In August of 2007 we started using a new online community platform that would allow us to also handle sign ups for our small groups, events, etc. It was a lot of work at first because we were changing the entire culture of doing things. We pushed it pretty hard in the beginning. We made a promotional video, sent home flyers, posted info on our website and had laptops in the back of our facility for students to sign up. We cast the vision as a way to stay connected with our ministry and a way to reach out to new people. One thing we did, which I think was the success to our strategy was that we forced our students to use it. We took one thing (small group sign-ups) and said, “If you want to be in a small group you need to be apart of our online community.” This worked for about 90% of our students over the course of 3-4 weeks. I have found that people are sometimes skeptical when it comes to new technology or new ways of doing things. Giving them a clear understanding as to why you are using this or doing things a different way will help get them excited about these new opportunities. Don’t be afraid to stop using paper by going completely online. Yes there may be some road bumps, but in the end it will be revolutionary.